This well known, showy species is native to tropical and subtropical South America, but is a highly invasive weed introduced into warm regions worldwide, and also commonly cultivated in water gardens in temperate zones. It is a free floating aquatic with distinctive inflated petioles that grows very rapidly and may cover substantial areas even during a single growing season. 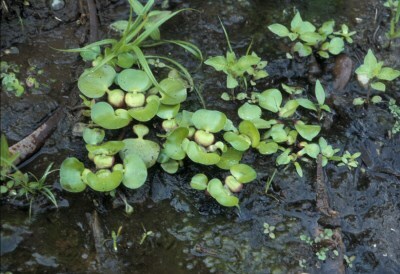 Though presumably unable to survive Michigan winters, it is regularly re-established each growing season through dumping of excess plants into waterways, or perhaps accidental dispersal. Documented in 2015 in the Detroit River and St. Clair River in Wayne and Macomb Cos. by B. Luukkonen, A. Dow, and K. Davis. MICHIGAN FLORA ONLINE. A. A. Reznicek, E. G. Voss, & B. S. Walters. February 2011. University of Michigan. Web. 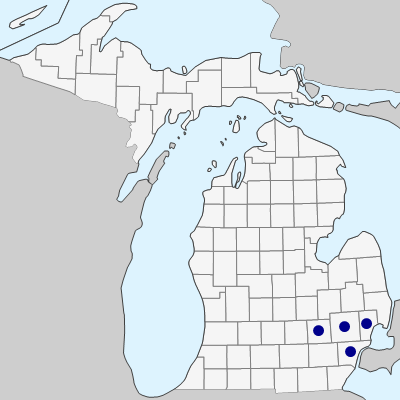 April 21, 2019. https://michiganflora.net/species.aspx?id=2924.